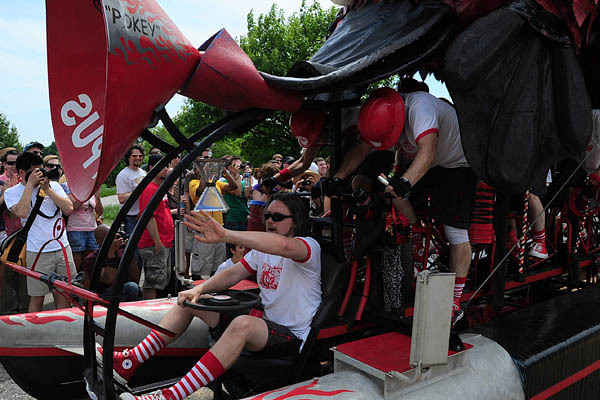 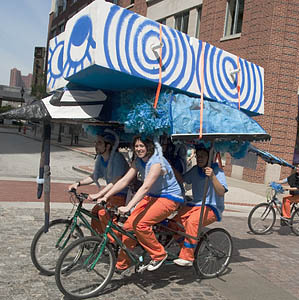 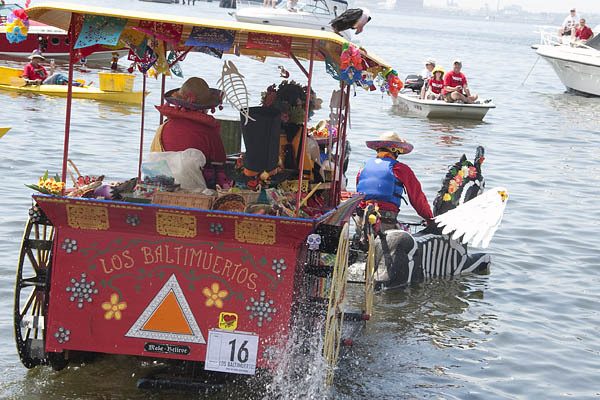 Baltimore’s own Make Believers team took home an unprecedented second consecutive prestigious Art award for Los Baltimuertos. 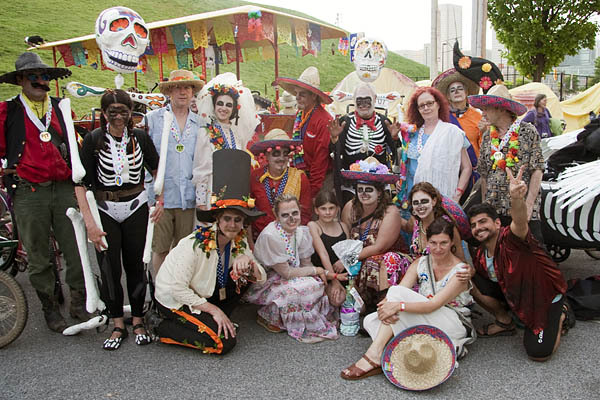 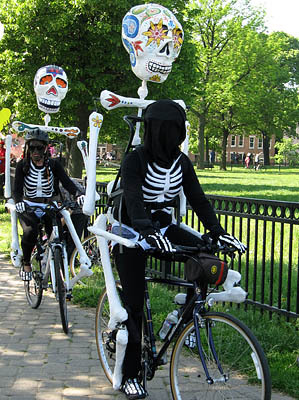 This 6-pilot sculpture is a Baltimore vision of the Day of the Dead (Día de Los Muertos) as celebrated in Mexico. 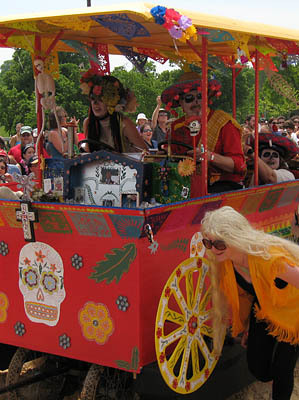 Those who have passed on are remembered with shrines of fruit, flowers, and gifts. 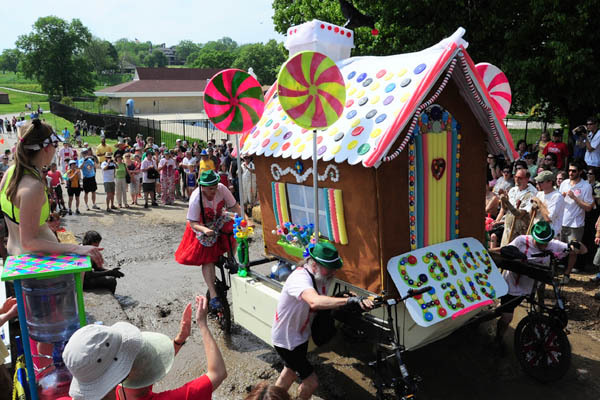 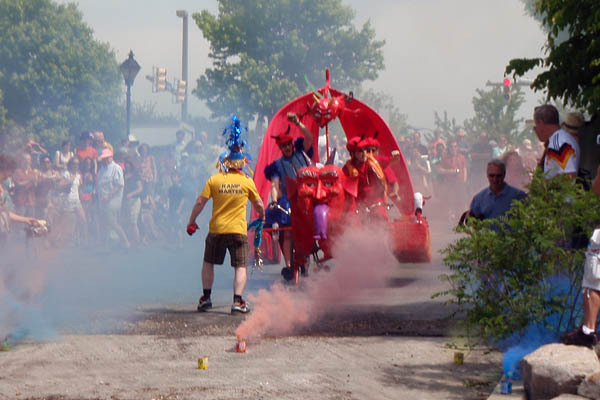 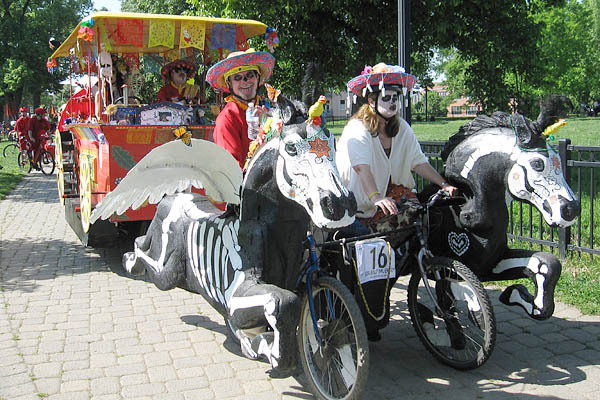 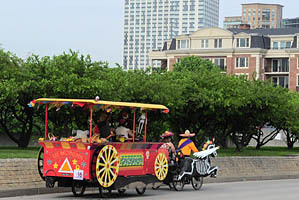 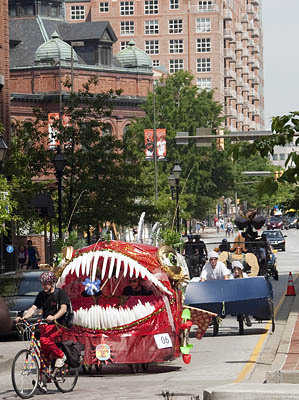 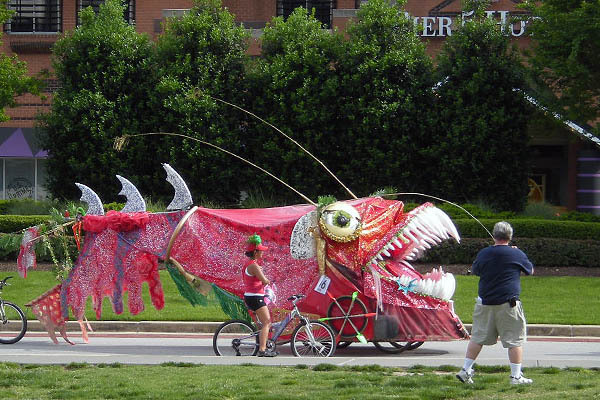 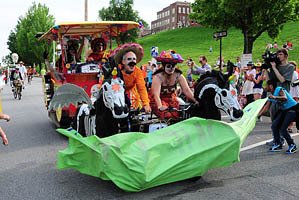 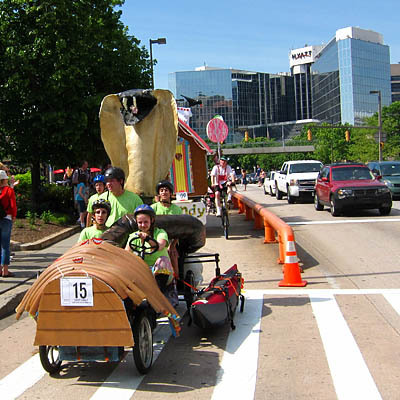 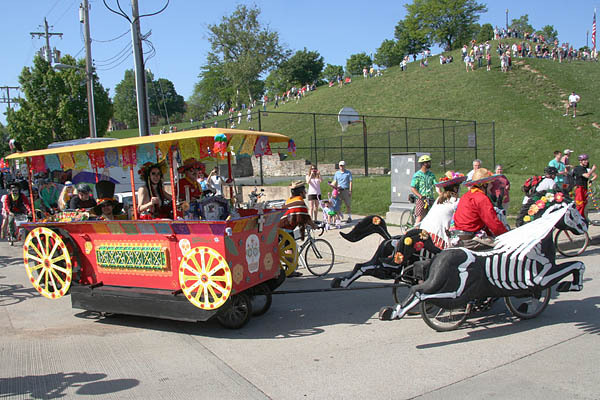 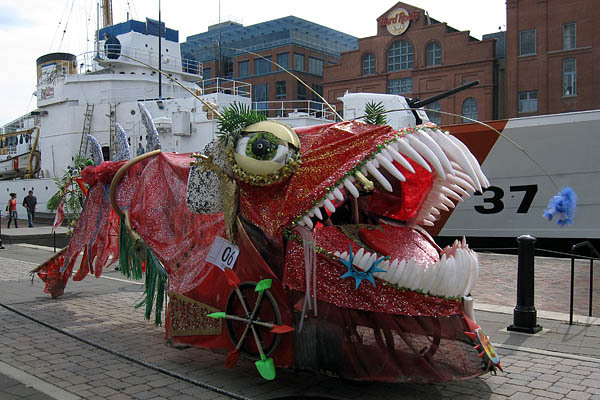 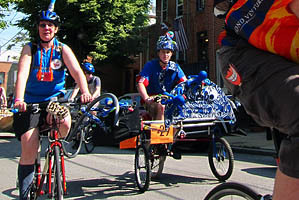 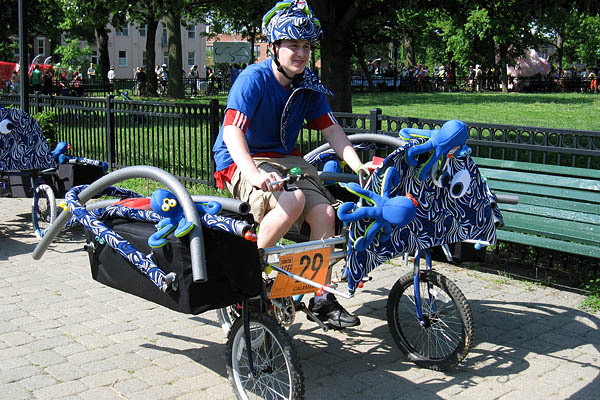 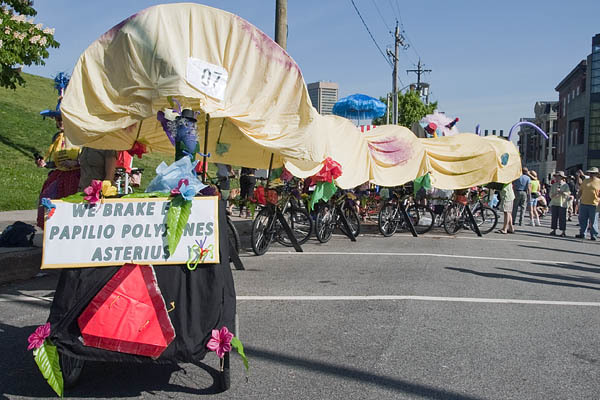 The wagon honors Baltimore’s Arabbers—vendors who drove fruit and vegetable carts for over a century, although this wagon is drawn by two spectacular skeletal horses. 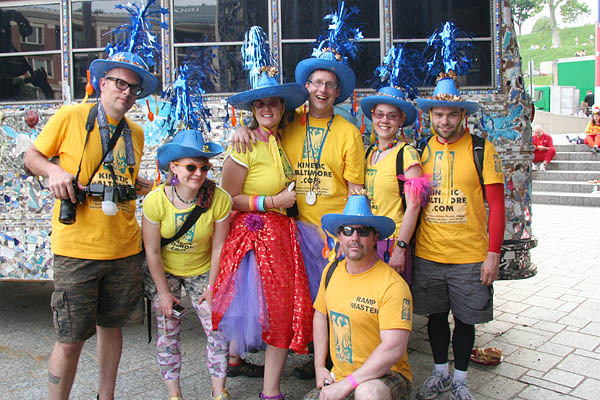 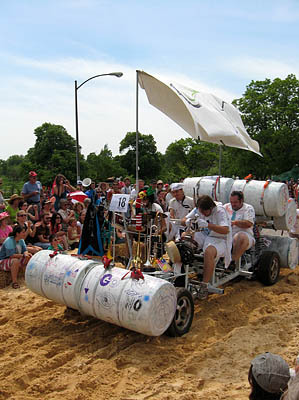 This is the ninth entry from the team led by Frank Conlan which has won numerous awards since they began making history with 2002’s The Grape Stompers. 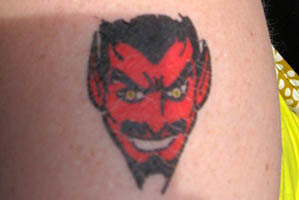 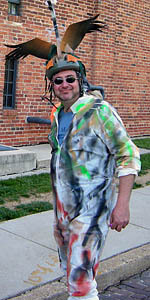 In 2009, their Art winner was Happily Never After. 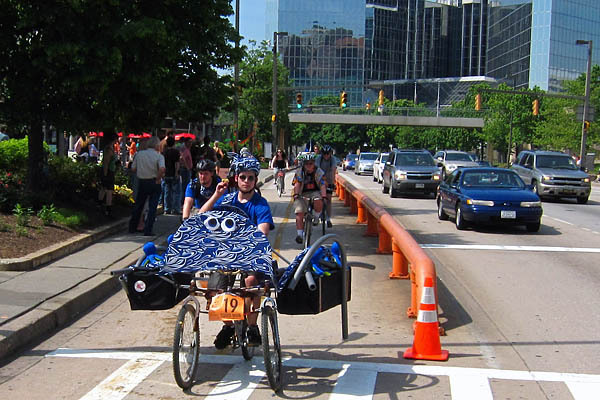 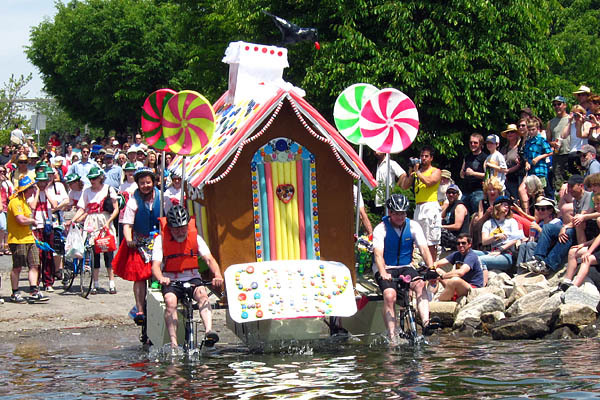 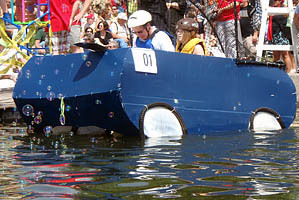 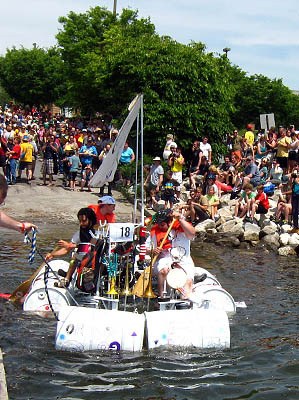 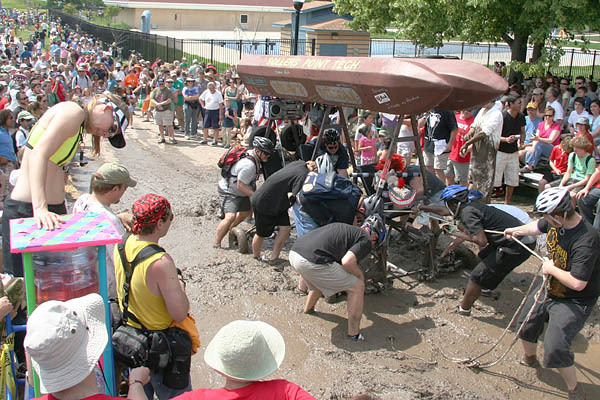 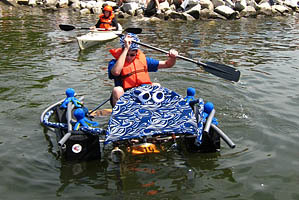 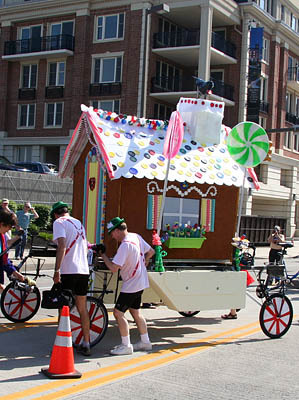 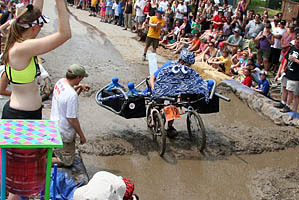 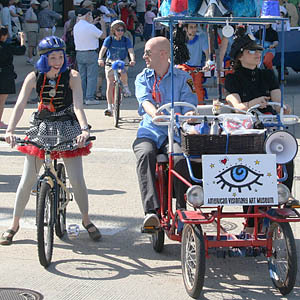 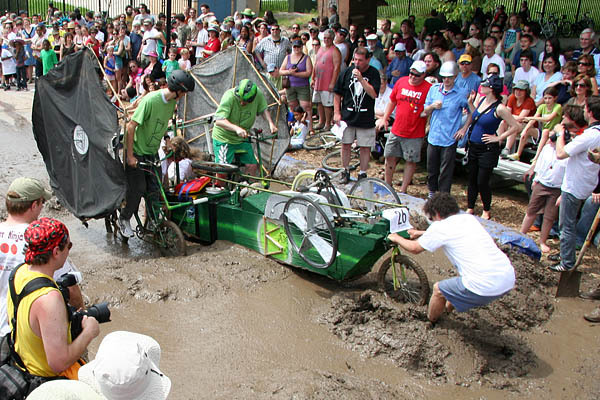 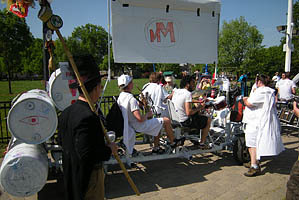 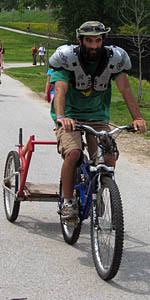 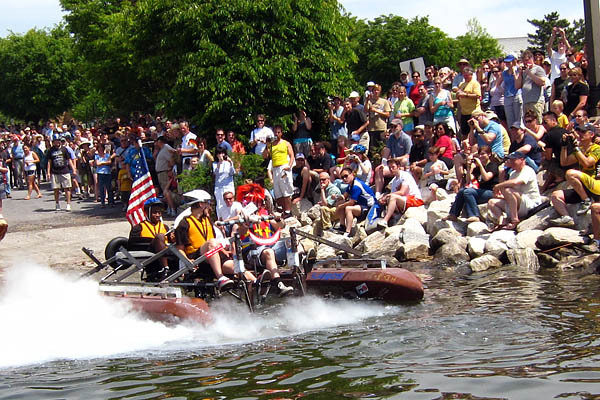 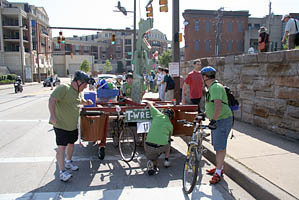 If you look closely, the rear cart wheels are paddlewheels for the water portion of the race, and black pontoons loft the cart. 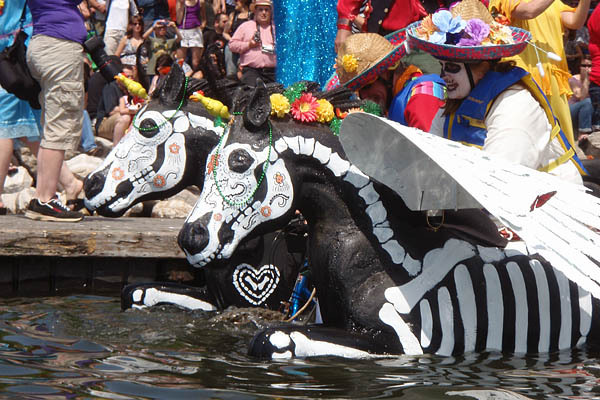 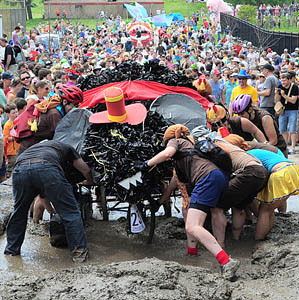 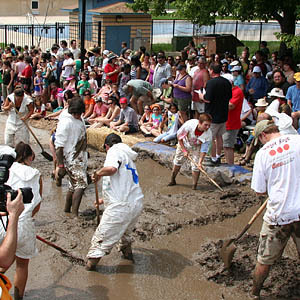 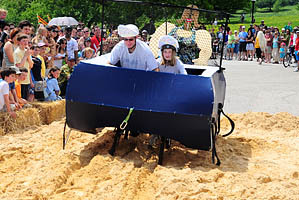 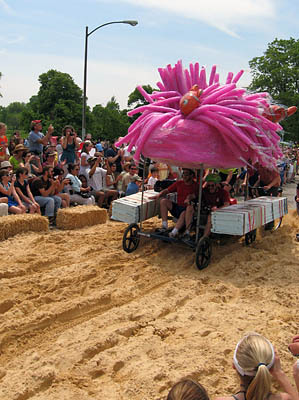 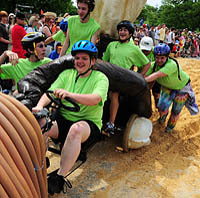 The horses provide their own flotation by being constructed of rigid closed-cell foam. 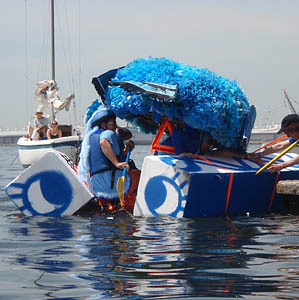 The 2009 Art trophy broke before they got it home; the 2010 trophy didn’t even make it out of the awards ceremony in one piece. 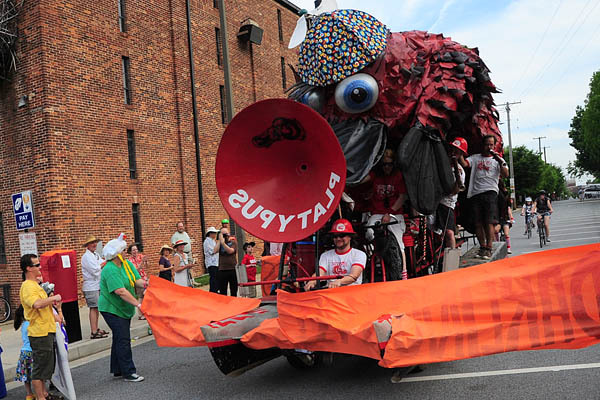 Note to trophy artists: hot glue does not adhere well to glass. 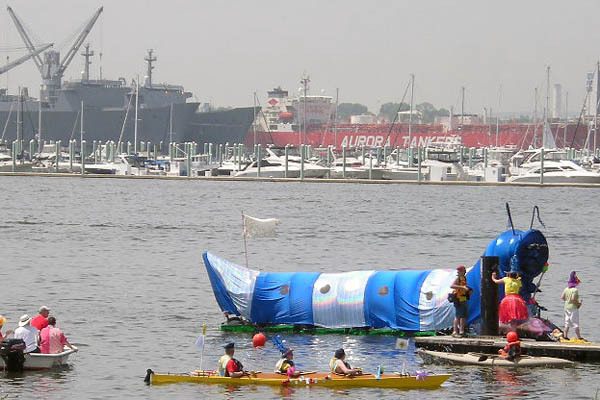 From the depths of the Chesapeake Bay came Chessie, a 25-foot long monster brought to the surface by the city’s dumping into the Harbor ice and snow from the past winter’s blizzards. 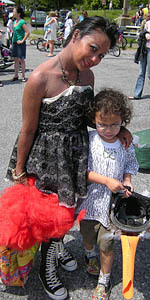 This is the fifth entry from Tony Walker and friends, who created 2009’s Rocky Horror Picture Shoe. 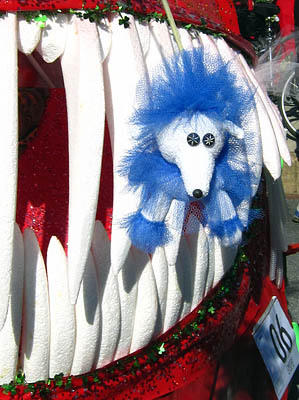 Chessie’s mandatory homemade sock creature was custom-knitted for the race, and showed such care as she dangled as bait in front of the sculpture like an anglerfish that Chessie won the Sock Creature of the Universe award. 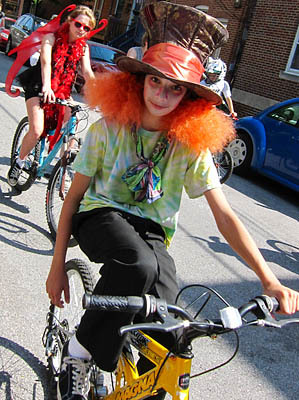 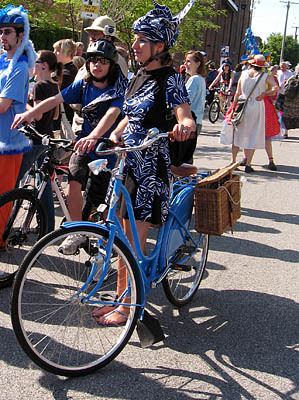 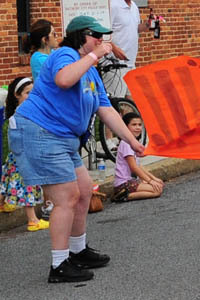 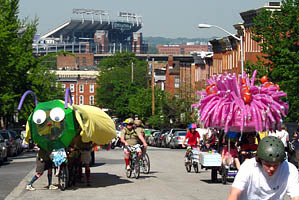 In the photo to the right, Chessie mauraudes a bicyclist along Pratt Street in Harbor East. 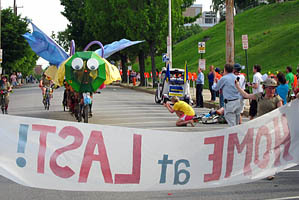 Seen from above just after the start, Chessie was one of the first sculptures to pull away from her parking space. 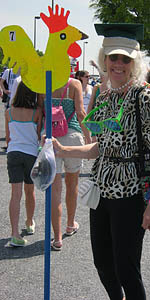 Chessie’s mouth was hinged to open and close as they navigated the racecourse. 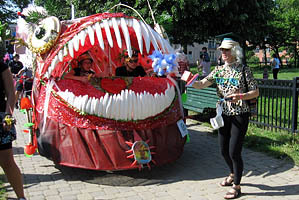 There’s no end to the benefits of putting a giant articulated fierce mouth on the front of a sculpture, not least of which is the appearance to passers-by that it is planning to consume anything it approaches. 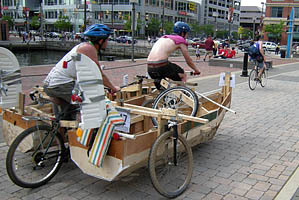 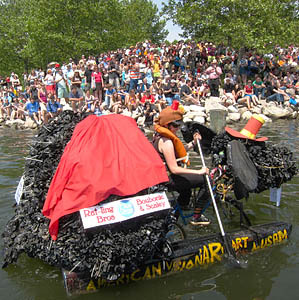 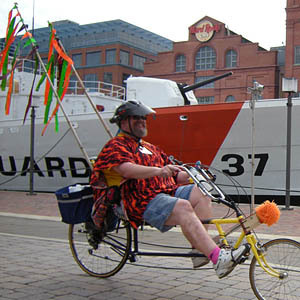 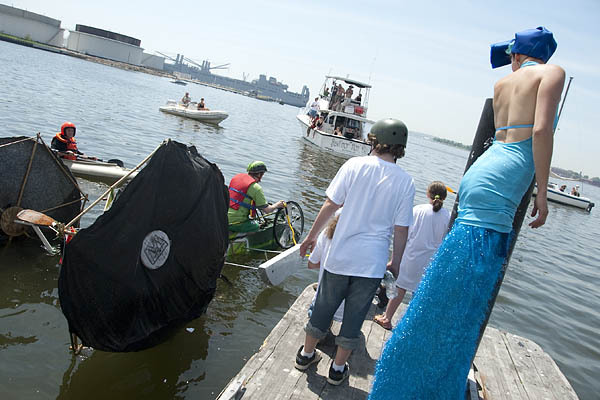 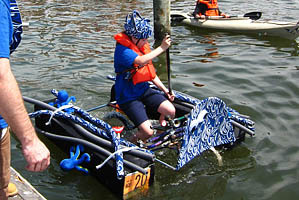 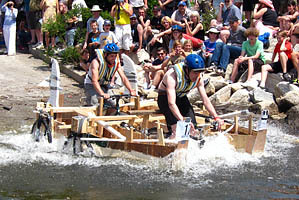 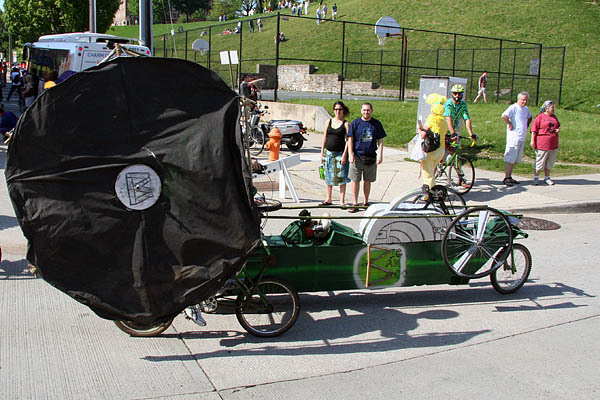 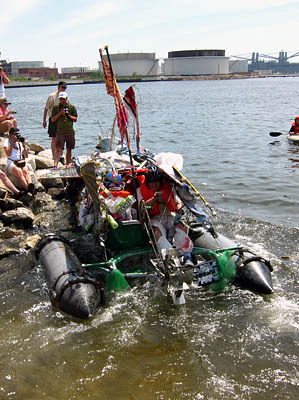 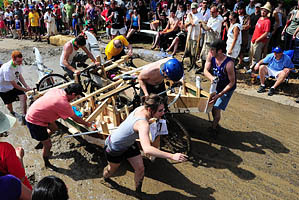 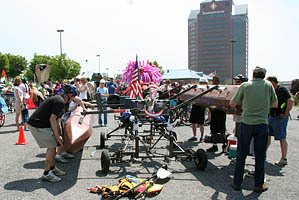 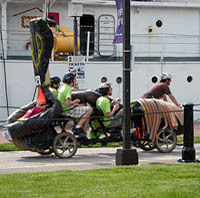 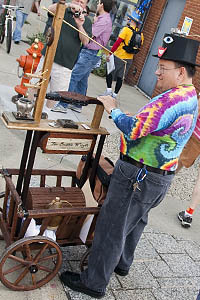 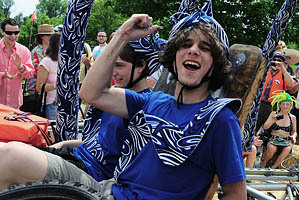 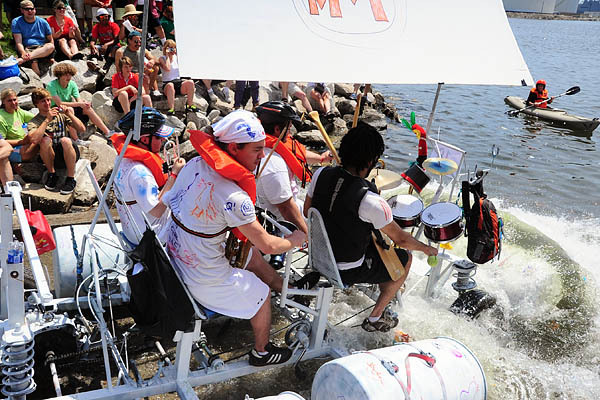 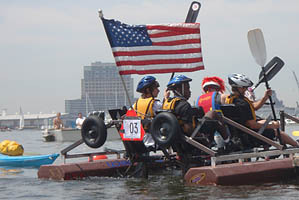 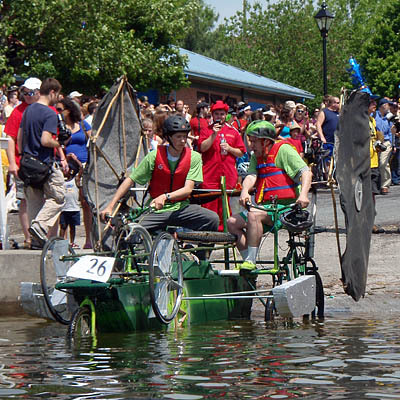 Chessie’s paddlewheels performed admirably in the Harbor, another example of a sculpture that clearly showed the benefits of being tested in water before the race. 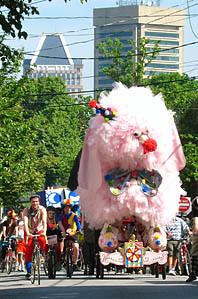 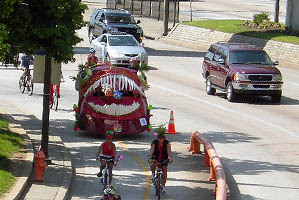 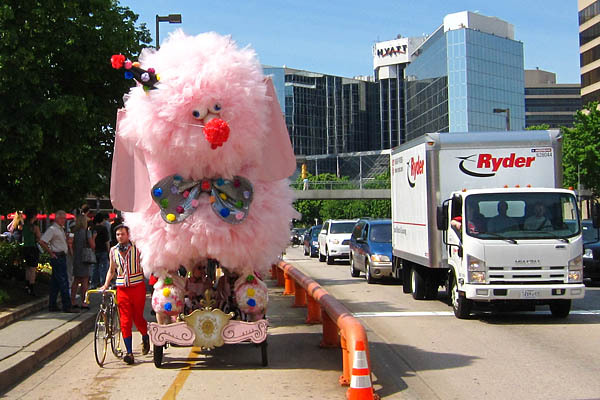 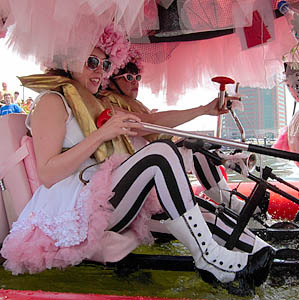 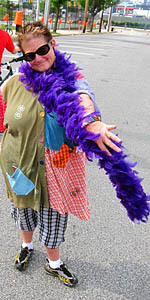 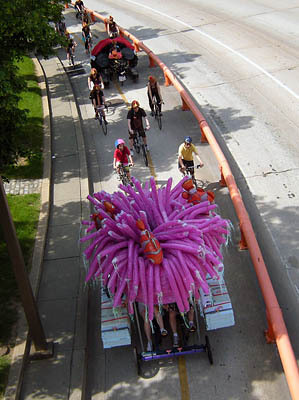 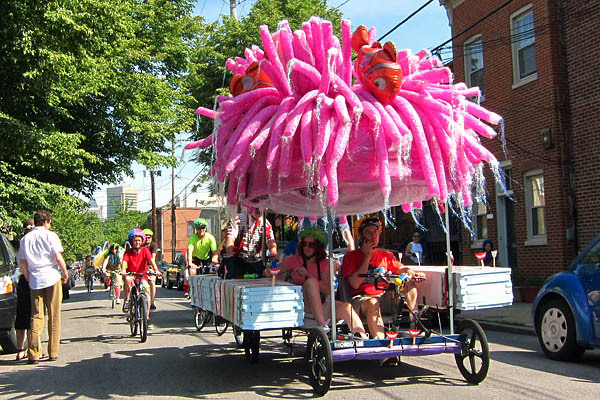 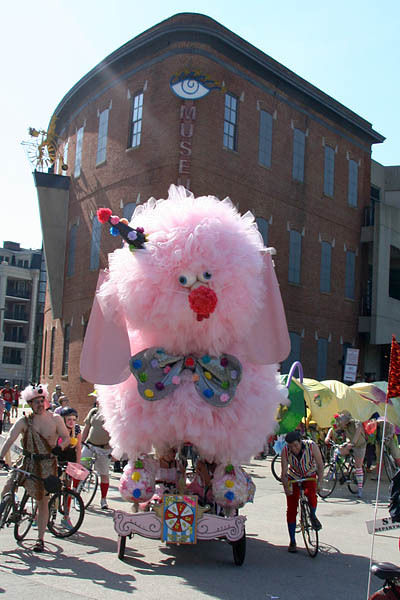 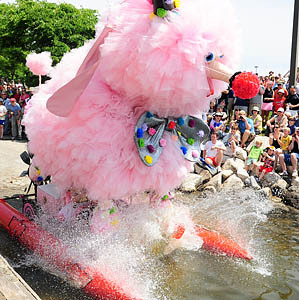 Also from the depths of the sea came Anemone Antics, a giant pink aquatic animal that roamed the streets of Baltimore with its friendly clownfish. 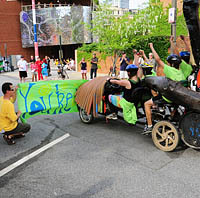 This 2-pilot sculpture comes from Bethesda, and was easily recognized throughout the city. 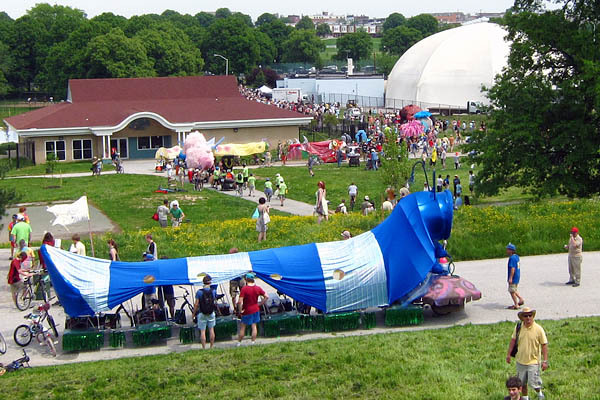 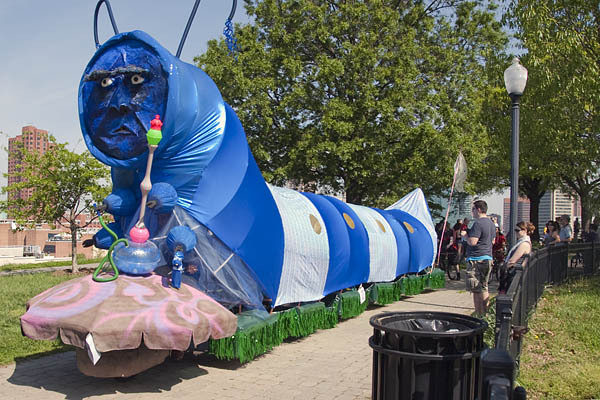 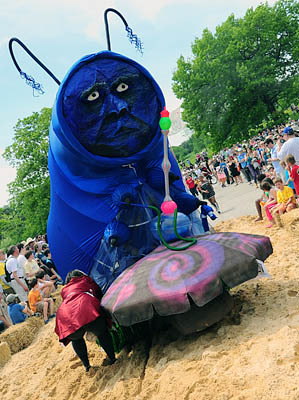 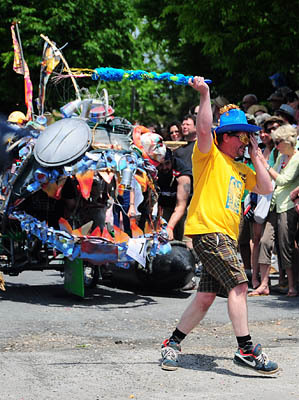 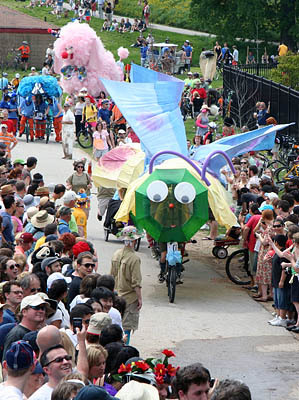 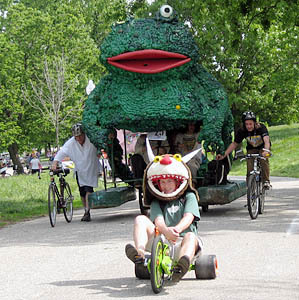 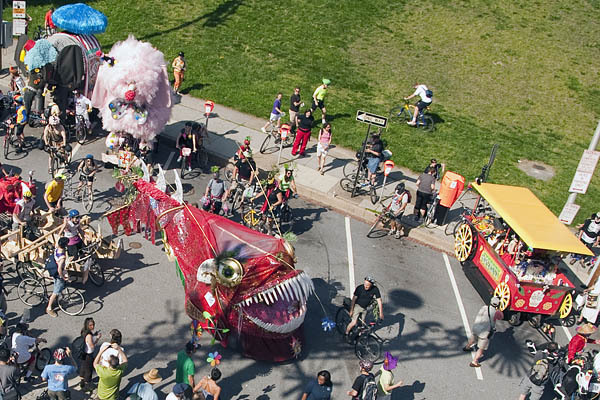 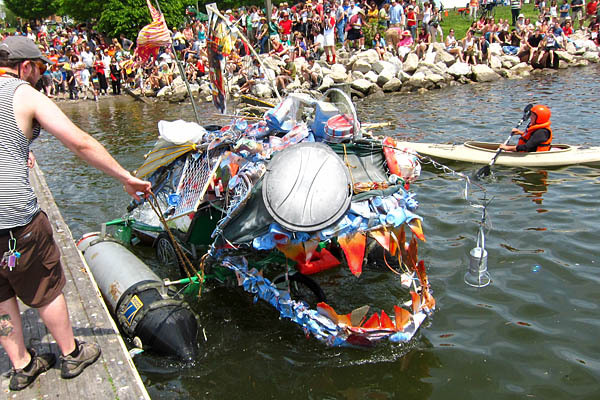 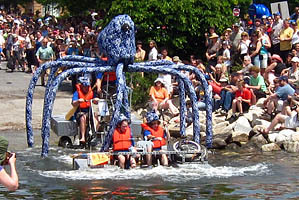 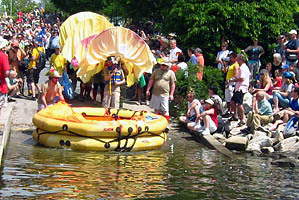 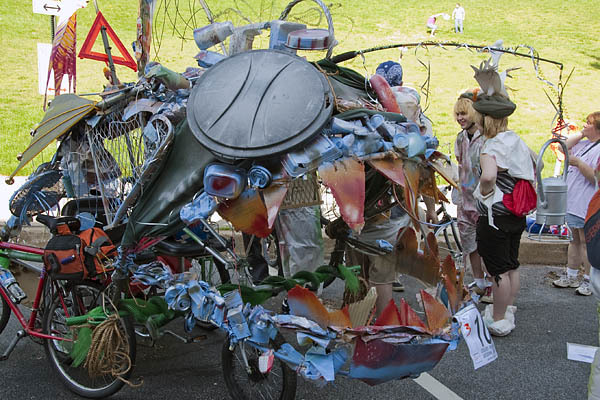 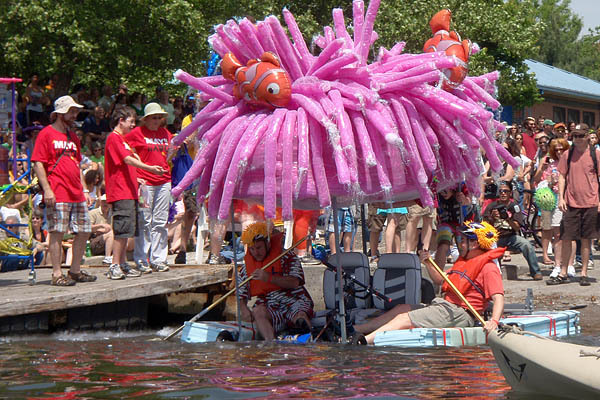 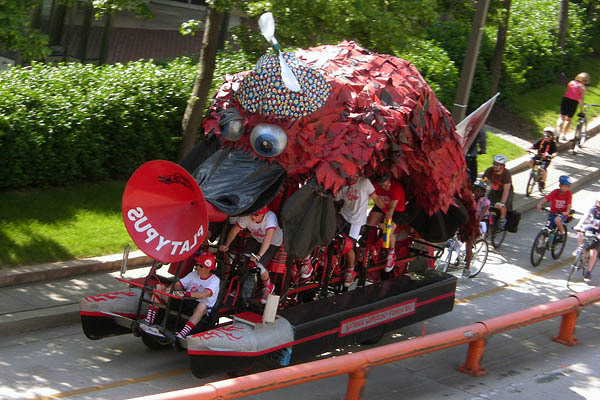 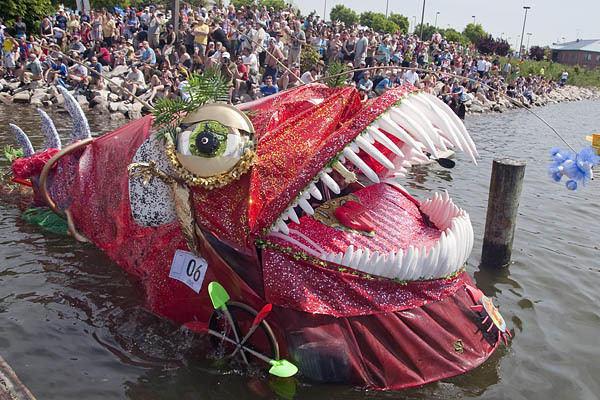 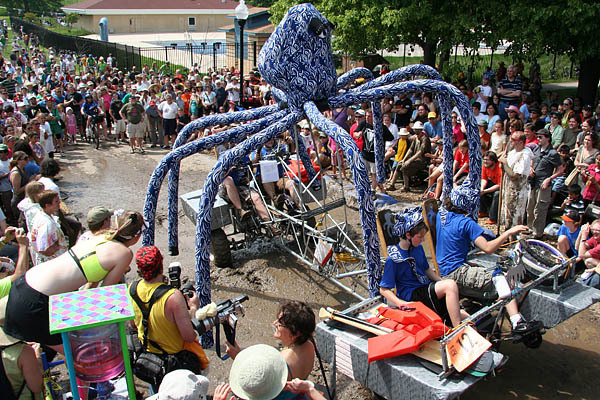 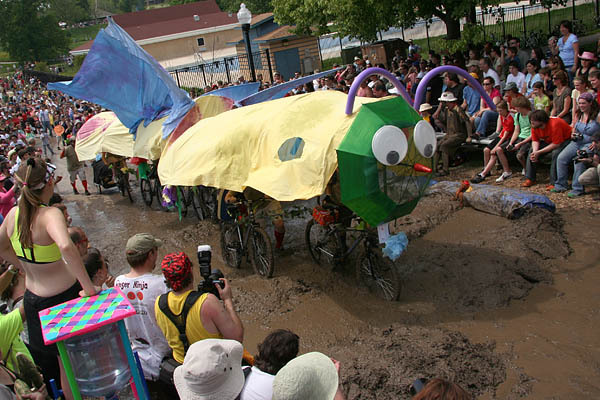 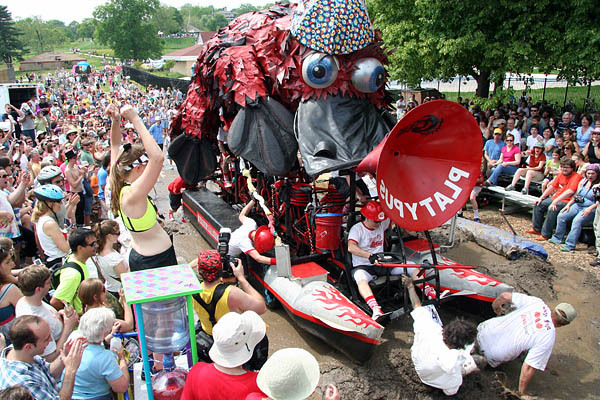 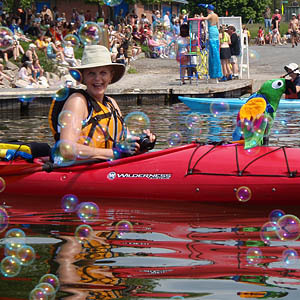 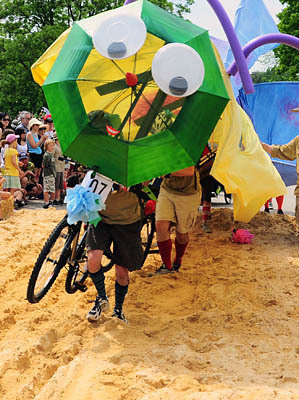 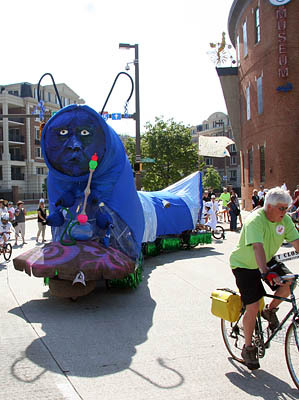 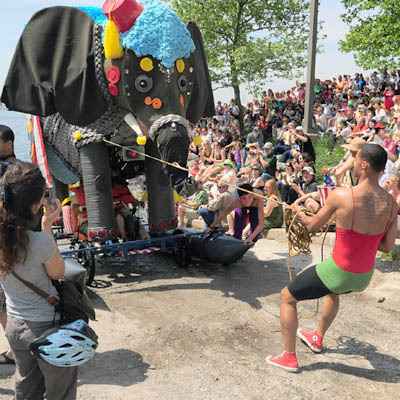 The Creature from the Lansdowne Lagoon arose from Lansdowne High School’s Student Government, Arts & Communication Academy and Engineering, Science & Info Tech Academy. 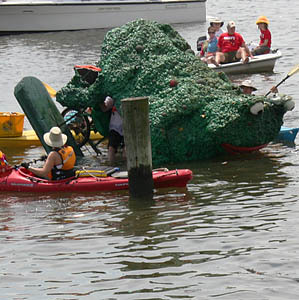 It bears a wide variety of trash removed from the school-side pond. 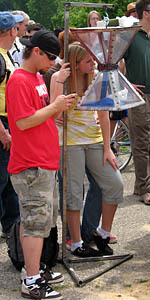 A lantern lure dangles out of its head as predatory bait, just as on an anglerfish. 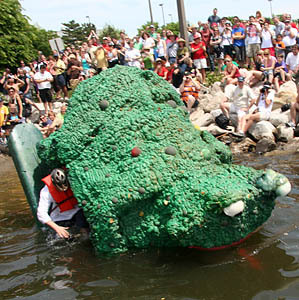 The Ramp Master reveals some angst while clearing The Creature for the water entry, perhaps foreseeing that it would immediately steer into the rocks. 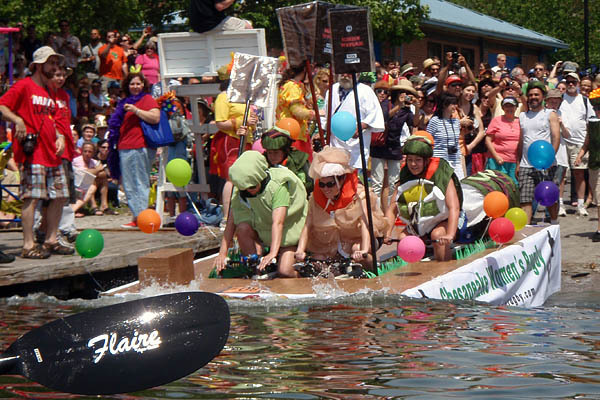 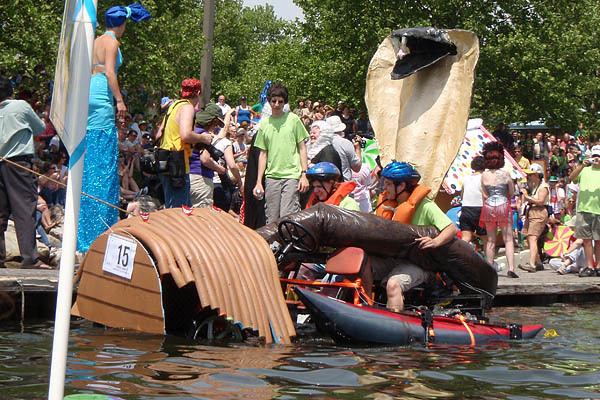 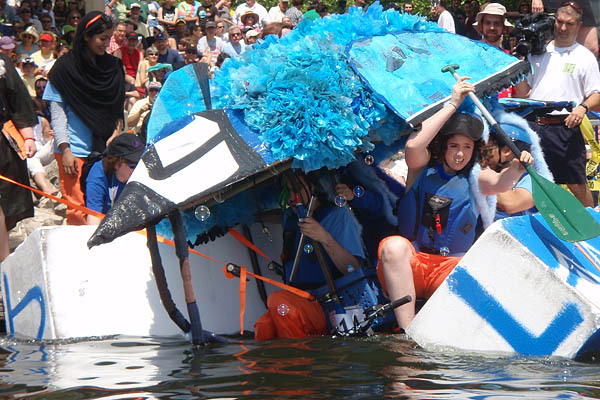 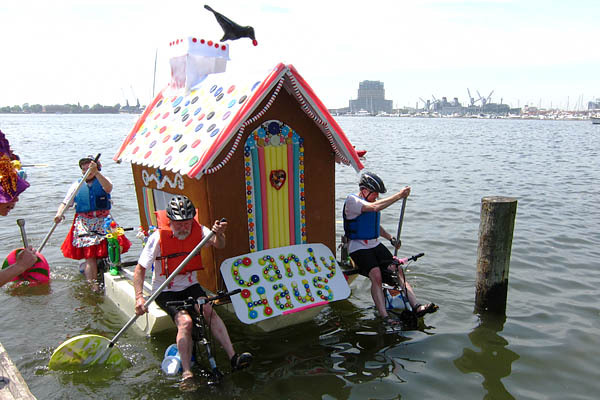 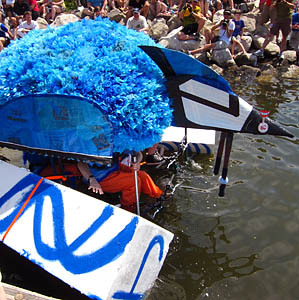 For their turmoil on the water, they won the Golden Flipper award for the “most interesting water entry”. 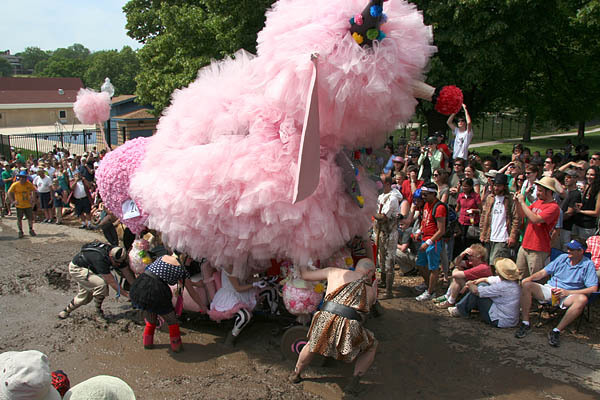 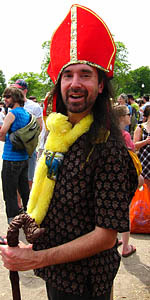 Once a rope was securely attached, a pit crew member kept the Creature on a short leash to ensure it did not deviate further from the racecourse. 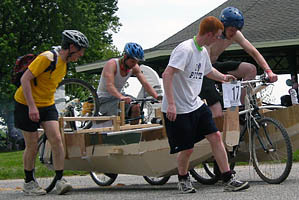 Early in the morning, the team prepared for the athletic rigor of the race with a stretching regimen—including one member with a colossal green dorsal fin. 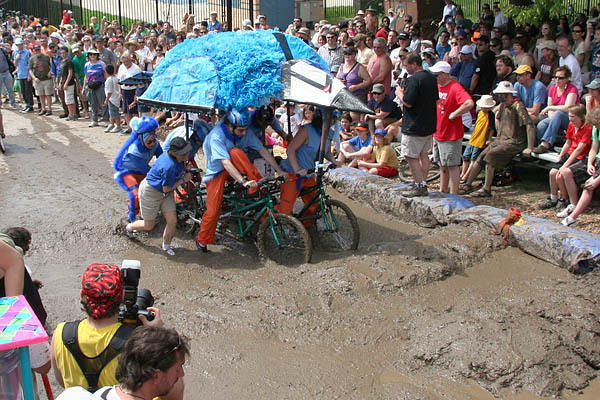 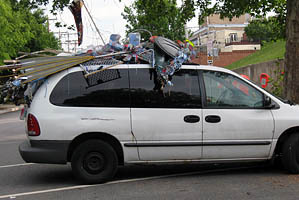 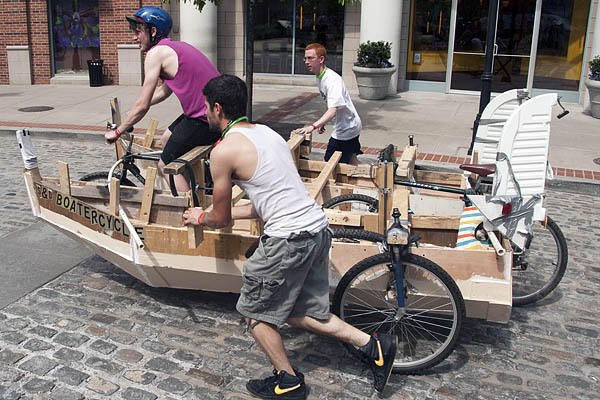 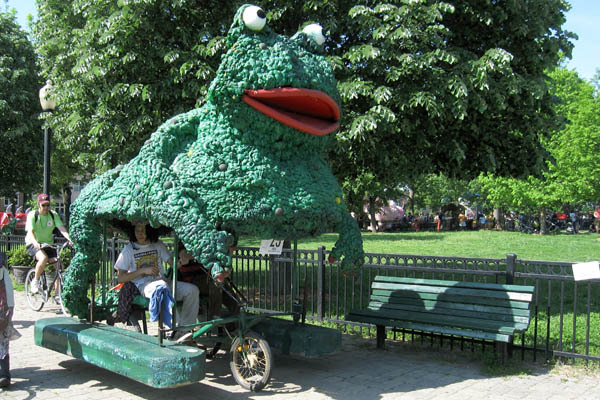 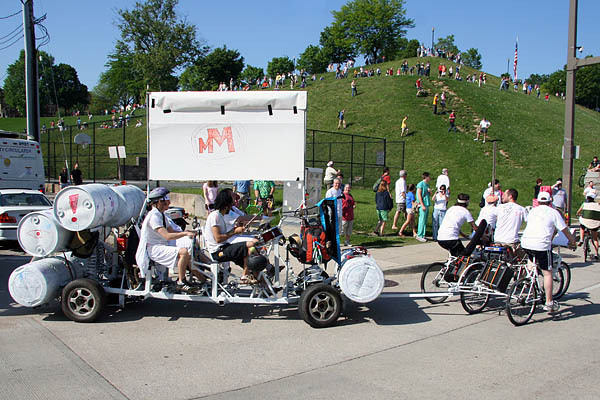 Après race, the sculpture stowed compactly atop a minivan. 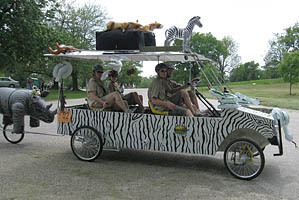 The Gottwald family of Great Falls, Virginia returned with Safari Attack in which they outrun a fifth-wheel charging rhinoceros in their “Land Rover”. 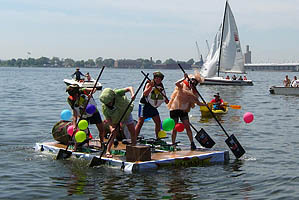 Their rooftop baggage during the land portions of the race was reconfigured into highly stable outrigger pontoons for the water entry. 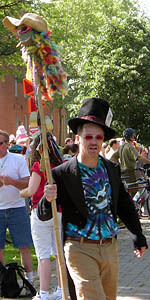 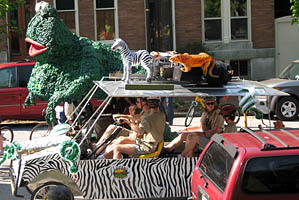 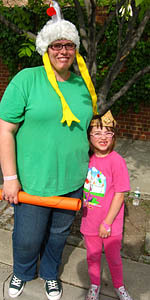 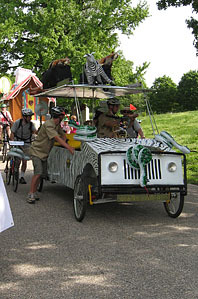 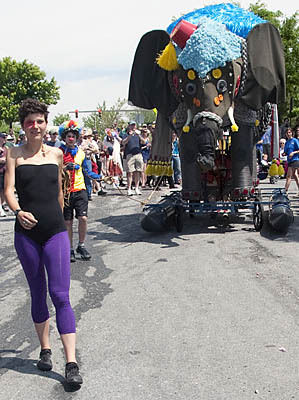 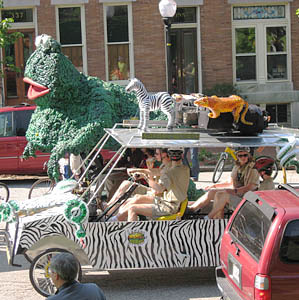 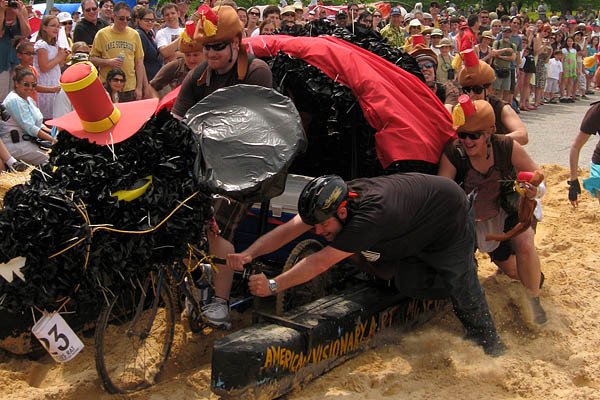 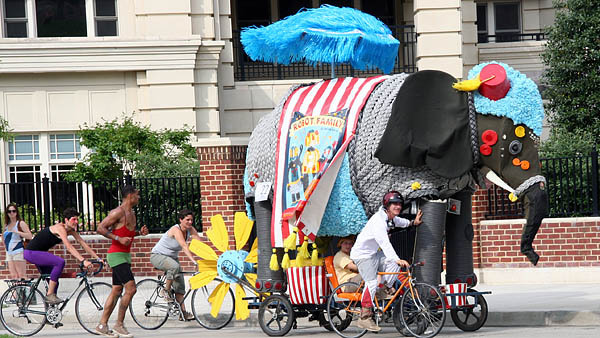 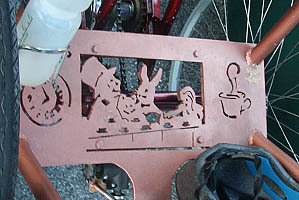 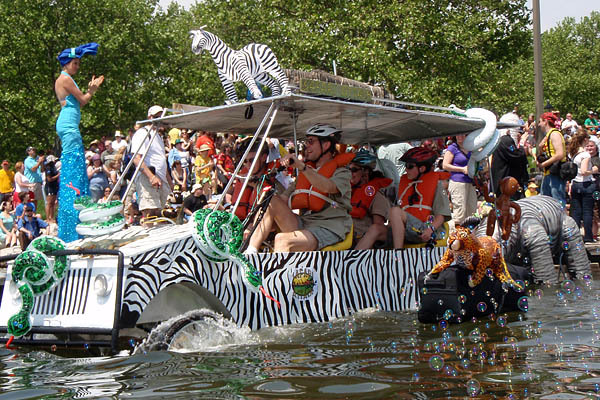 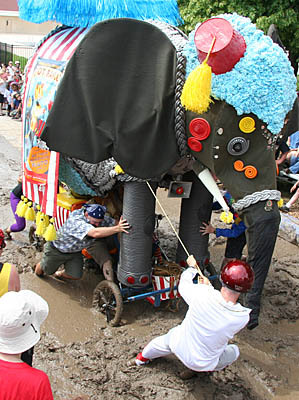 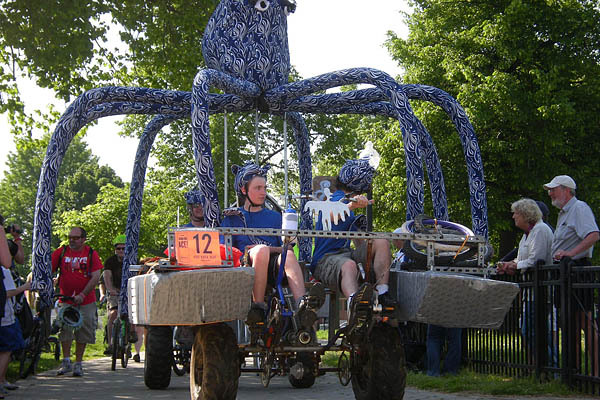 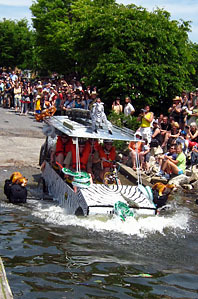 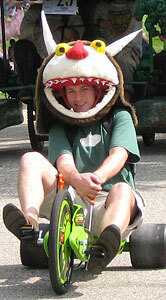 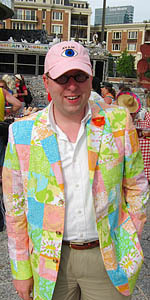 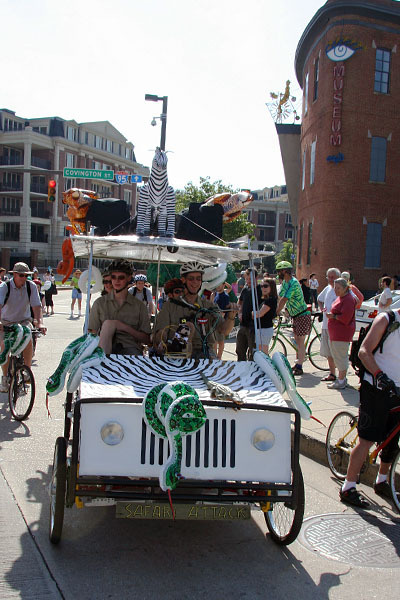 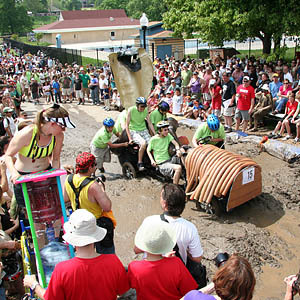 Safari Attack showed the Gottwald’s consistent effective engineering that won 2009’s Grand Mediocre East Coast Championship with Goin’ Griswold. 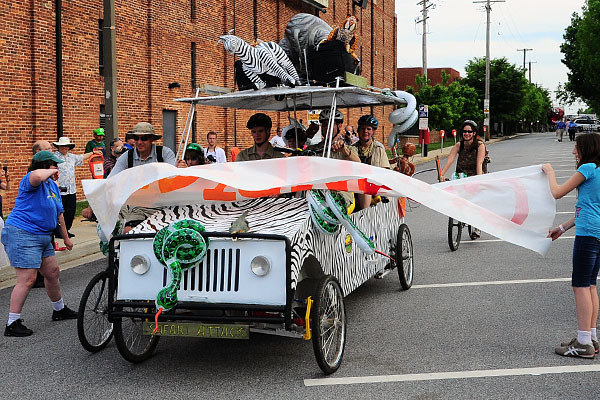 By the time they crossed the finish line, the rhino was so exhausted from charging them that they removed it from the back of the sculpture and put it on the roof with the zebra and tiger. 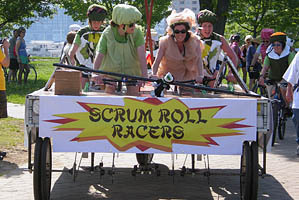 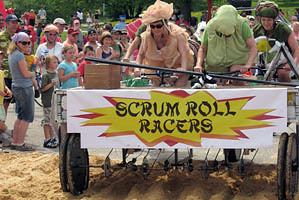 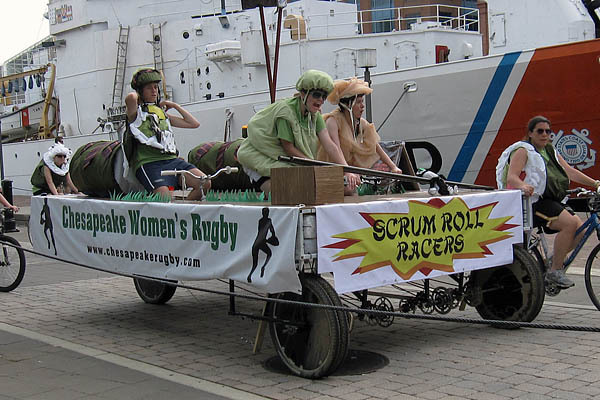 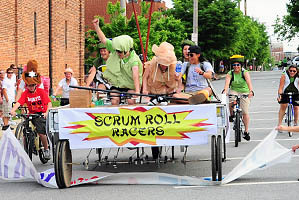 The Chesapeake Women’s Rugby Team created Scrum Roll Racer, a 4-pilot sushi tray. 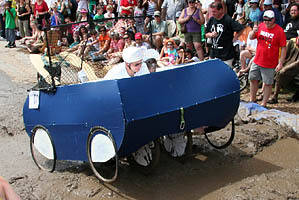 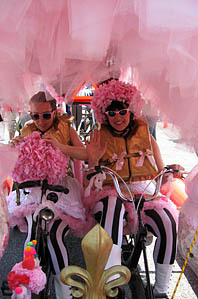 With one pilot in front disguised as wasabi, the other as pickled ginger, and the two in back as makizushi rolls, they cranked their front-wheel drive, rear-steering tricycle through the race. 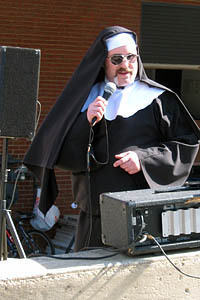 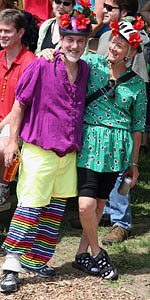 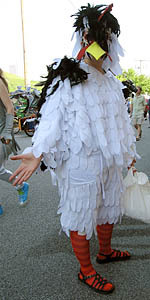 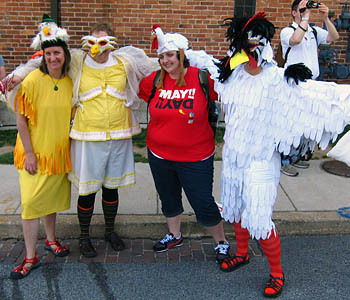 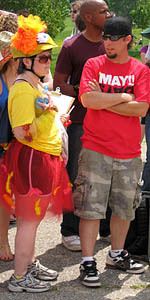 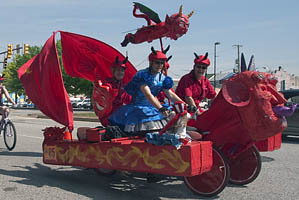 They won Best Costumes for their thematic garmenture. 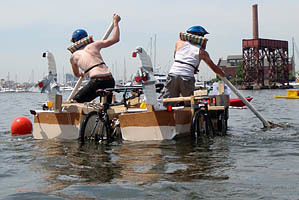 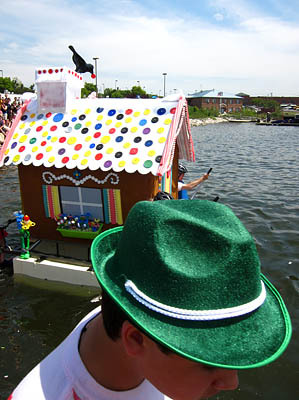 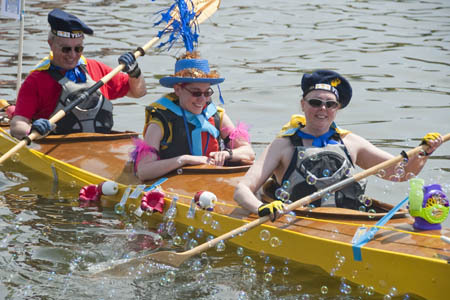 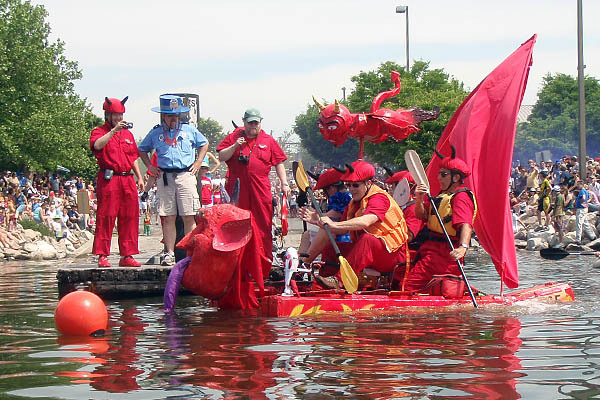 On the water, they broke out paddles designed as giant soy-sauce packets on sticks. 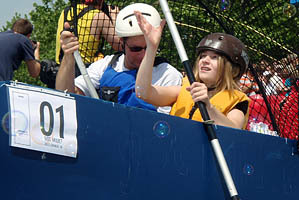 Flotation consisted of a wide variety of plastic bottles stuffed into the frame. 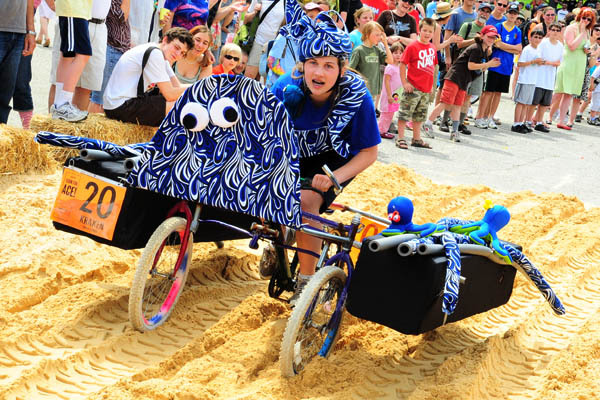 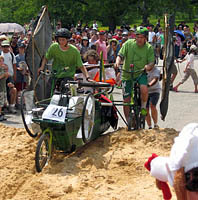 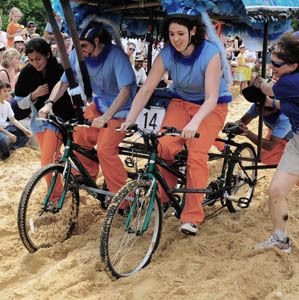 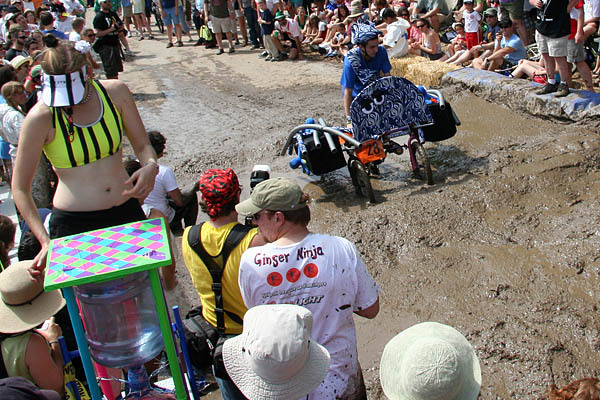 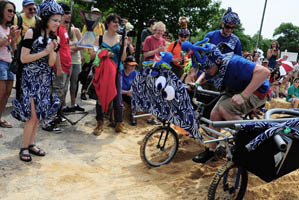 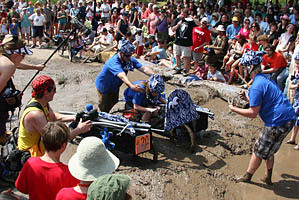 With three sets of twin wheels and low gearing, they cranked through the sand and mud, but needed pushing (and did not receive an ACE therefore). 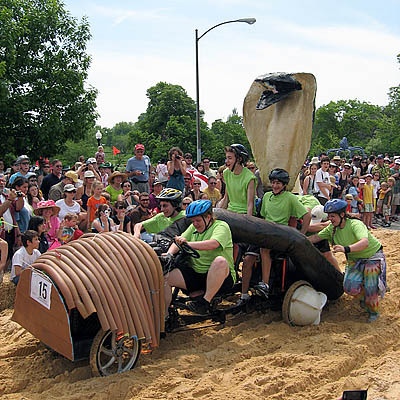 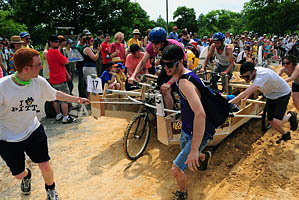 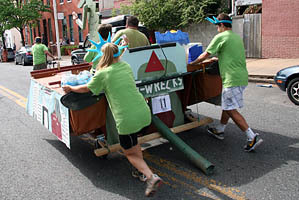 T-Wrecks was a late-built entry from Crofton, designated by its creators as a candidate for the Golden Dinosaur award. 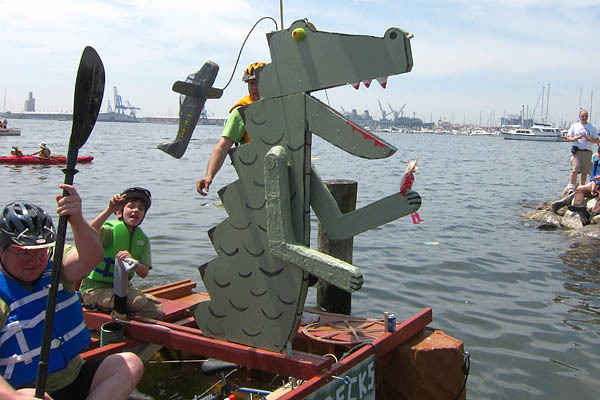 It had 3 pilots, and in the Godzilla tradition, one plane and one helicopter. 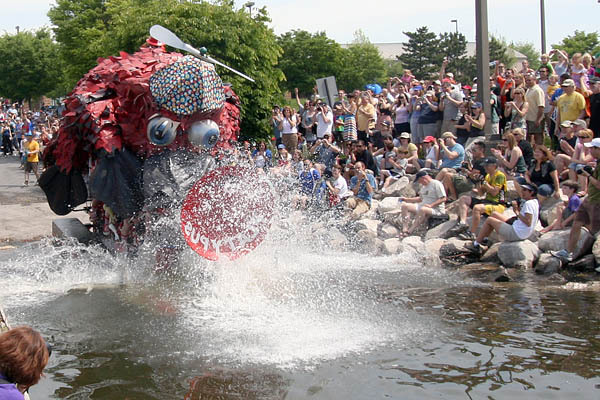 It shot water from its nose. 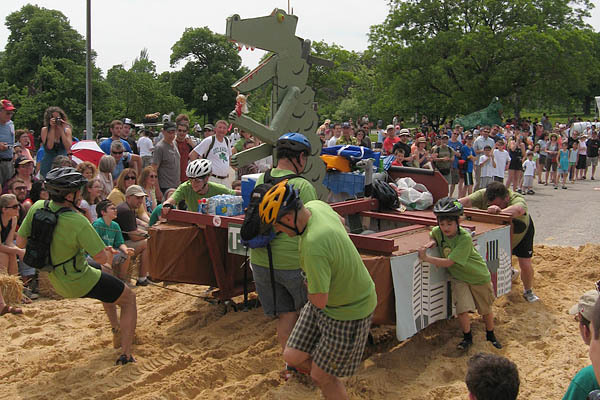 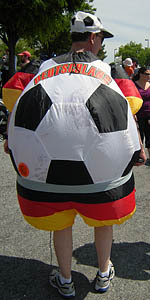 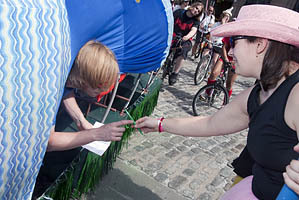 They dropped dino-eggs through the tail, consisting of brown-painted easter eggs filled with candy and plastic police, and won the Best Bribes award. 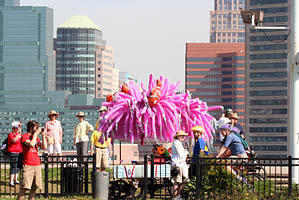 They were the only sculpture to finish after Fifi. 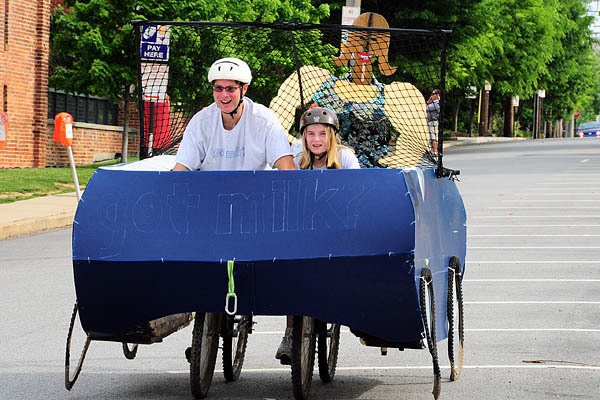 It took some figuring, but the Got Milk sculpture consisted of a woman pushing the two pilots in a stroller, which the Kelly family of Falls Church who created it described it as “a journey to find milk”. 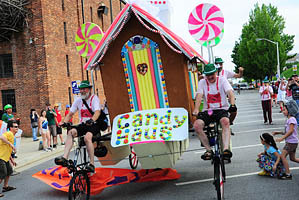 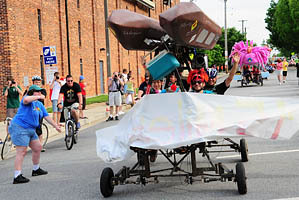 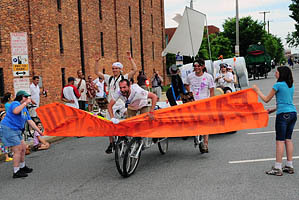 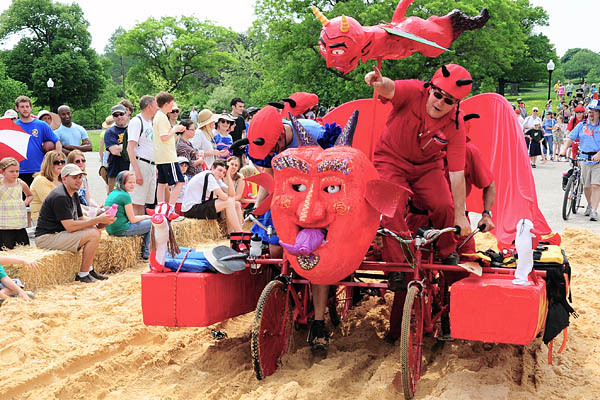 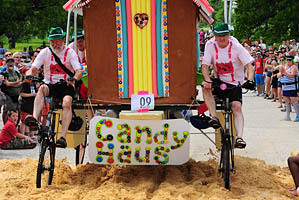 They closely followed front-runner Going to Hell sculpture most of the race—and pulled ahead when Hell broke down to win the Speed award.